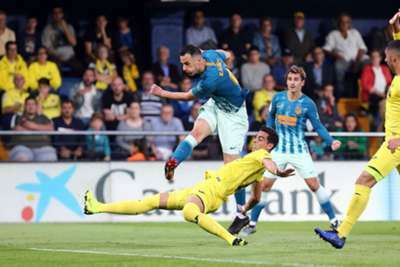 Atletico Madrid missed the opportunity to go top of LaLiga as Mario Gaspar's strike secured a 1-1 draw for Villarreal at the Estadio de la Ceramica. After a sluggish start to the season, which saw Atletico win just one of their opening four games, Diego Simeone's side had given themselves a glorious chance of reaching the league's summit on Saturday with three wins in their four previous outings. Filipe Luis looked to have set them on their way to another victory, heading in after 51 minutes on a day where rivals Real Madrid continued their slump with a loss to Levante, but Mario's deflected effort 14 minutes later earned Javi Calleja's side a deserved point. Villarreal could have even gone on to win the game, but were kept at bay by some superb goalkeeping from Jan Oblak, while Atletico had their chance to win it when Thomas Lemar somehow headed Juanfran's cross wide with a minute remaining. The closest either side came during a tepid opening half-hour was Antoine Griezmann's dipping effort from 25 yards, which flashed just over Sergio Asenjo's crossbar. Oblak had to be alert soon after to tip over Jaume Costa's deflected strike and preserve his side’s status as the only team in Europe's top five leagues not to concede a first-half goal this season. The visitors forged ahead after the restart when Griezmann's inswinging free-kick was headed against his own crossbar by Ramiro Funes Mori and Filipe nodded in the rebound from 10 yards. They were pegged back after 65 minutes, however, when Mario's low strike was deflected past Oblak by Filipe after a goalmouth scramble. The goalkeeper had to be at his very best to push away Pablo Fornals' drive soon after and then thwart the clean-through Carlos Bacca to ensure his side at least left with a point. Atletico almost claimed victory with Lemar's late chance, but an end-to-end finish did not produce a winner. Their time at the summit could have been a short one given that a Barcelona or Sevilla win in their match later on Saturday would have dethroned them, but it would still have been quite the achievement after their poor start to the campaign, and a chance to capitalise on the chaos at Santiago Bernabeu. A draw was no disgrace, though, and stretched their unbeaten run in the league to six games. Villarreal, meanwhile, will be buoyed by their stirring second-half display and should get back to winning ways soon if they continue to play like that. Oblak sat out of Slovenia's games during the international break, and it proved to be a wise move with a superb performance to deny Villarreal. He was immense in the second half and was only beaten for the equaliser by a cruel deflection, ending the match with five saves. He scored twice in France's win over Germany in midweek, but Atleti's talismanic forward was way short of his best on Saturday. Griezmann's free-kick led to the Filipe goal, but in open play he was comfortably kept at arm's length by the Villarreal backline, and he only had one shot all game - typical of a poor attacking display from his side. - Atletico have failed to win their last seven LaLiga games against Villarreal (D3 L4), their second-worst active run against a single opponent (Barcelona - 16). - Filipe scored his very first headed goal in LaLiga (14 goals in 332 appearances). - Villarreal have failed to win each of their last six home league matches (D3 L3), equalling their worst streak at home in the top flight recorded in October 2003 (D5 L1). - This is the first Villarreal season that they failed to win any of their first five LaLiga home games (D2 L3). - Oblak has saved 14 of the last 15 shots on target he has faced in LaLiga. Atleti resume their Champions League campaign on Wednesday with a visit to Bundesliga leaders Borussia Dortmund, while Villarreal host Rapid Vienna a day later in the Europa League before a Saturday league trip to high-flying Deportivo Alaves.